No, the title of this post is not talking about my life but rather a book I just finished...Things Fall Apart by Chinua Achebe. I found it in a pile of old books in my brother's old room-I think he had to read it for a class in high school. It looked interesting and so little by little over break, I'd read it before bed, along with some other books which I'm sure I'll review here too at some point. 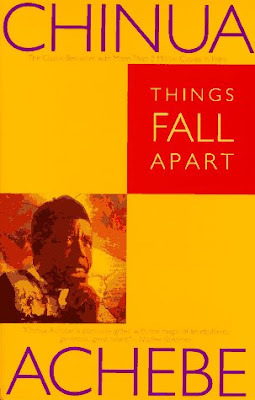 "Things Fall Apart is a 1959 English-language novel by Nigerian author Chinua Achebe. It is a staple book in schools throughout Africa and widely read and studied in English-speaking countries around the world. It is seen as the archetypal modern African novel in English, and one of the first African novels written in English to receive global critical acclaim. The title of the novel comes from William Butler Yeats' poem, The Second Coming. The novel concerns the life of Okonkwo, a leader and local wrestling champion throughout the nine villages of the Igbo ethnic group of Umuofia in Nigeria, his three wives, his children and the influences of British colonialism and Christian missionaries on his traditional Igbo (archaically spelled "Ibo") community during an unspecified time in the late 1800s or early 1900s." I think it was interesting to see views from inside an ethnic group other than mine. Even though it is normally not the type of book I would pick up to read, I thoroughly enjoyed it and somewhat savored it. I learned things from the characters and their interactions-a deep sense of their thoughts and world. On the other hand, the way humans just take over other humans in so many ways (emotionally, physically, spiritually and/or psychologically) never ceases to amaze and sadden me. Today, I am grateful for: 2 new books on eating better and juicing in the mail, being able to read, sunshine, friends, family, God and love. That's true you'll see my movie. Hopefully sooner than later as there is a completed screenplay, we're just trying to find the time to get the filming completed.